The company responsible for four condo highrises on downtown's 104th Avenue is set to build two more. The company responsible for four condo highrises on downtown's 104th Street is set to build two more. Langham Developments plans to build a 37-storey tower on the corner of 104th Street and 100th Avenue, with an adjacent 43-storey tower to follow. Falcon One will offer 296 units, while Falcon Two will contain 356. City council approved rezoning the empty lot on Wednesday to make room for the towers. President Reza Mostashari predicts the project will continue the revitalization of the popular downtown street. "Our twin towers will add to the vibrancy of 104th Street and contribute to the liveability of Edmonton's downtown core," Mostashari said. "Its modern, contemporary architectural design is distinctive and will leave a lasting impression on the city centre." The company is hoping the location near Rogers Place, the downtown night scene, the 104th Street farmers market and the Bay Enterprise Square LRT station will draw prospective tenants. 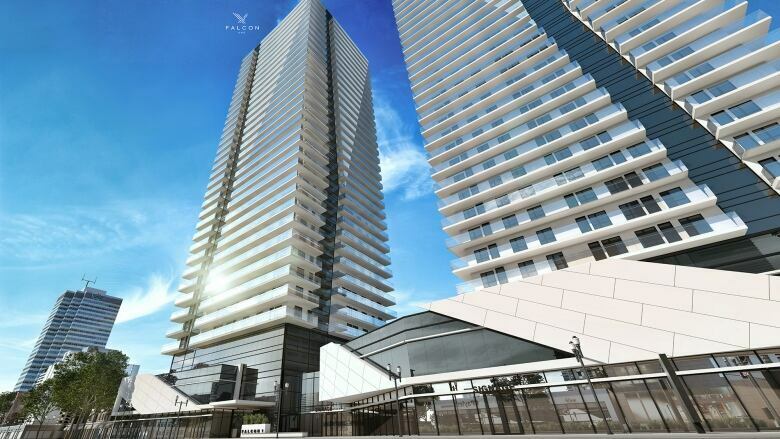 Falcon One will feature large outdoor spaces and open-concept design with a "family focus" by ensuring a number of three-bedroom units in the towers, Mostashari said. The Falcon towers will include retail space for a range of businesses and be set back from the street to keep from "encroaching on the existing pedestrian realm on 104th Street." Langham has built five other downtown towers, including the Icon Tower I and II and the Fox I and II, all on 104th Street, and the Omega on 105th Street. "We are excited about continuing our legacy of building some of Edmonton's most spectacular residential condominium towers," Mostashari said. Langham is set to start selling units for Falcon One later this year with construction set to begin in 2019.